Hydrofluoric acid is a colourless, fuming liquid. It is a unique acid, in that most of its toxicity is due to the anion, fluoride, and not to the cation, hydrogen. Hydrofluoric acid is a colourless, fuming liquid. It is a unique acid, in that most of its toxicity is due to the anion, fluoride, and not to the cation, hydrogen. Most acids cause burns and necrosis from liberated hydrogen ions. Undiluted hydrofluoric acid is a strong acid. Upon dilution, hydrofluoric acid is only weakly acidic at 0.1M. · 90% solution: petroleum refining, pharmaceutics, and germicides. · 10% solution: tanning, glass and metal etching, and rust removal. Unclear, but is probably in the range of 10 to 15 ml. Ingestion of hydrofluoric acid may be associated with signifi-cant systemic absorption and manifestations such as hypocal-caemia, acidosis, and shock. · Decalcification and destruction of bone. · Production of insoluble salts—calcium and magnesium fluoride. · These effects result in hypocalcaemia and hypomagnesaemia. 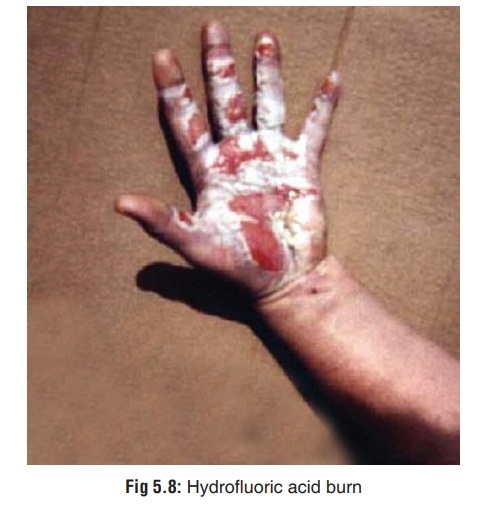 · Hydrofluoric acid burns can range in severity from 1st to 3rd degree. Characteristic features include severe pain and predilection for the sub-ungual area (i.e. under the nail) of fingers with destruction and loss of nail, and sometimes even the entire terminal phalanx. 1. A hallmark of dermal exposure to low concentrations of hydrofluoric acid is pain that is out of proportion to the physical examination. Severe pain may be obvious, while only erythema of the exposed skin is observed. 2. Hydrofluoric acid readily penetrates the skin and mucous membranes, causing deep tissue destruction (Fig 5.8). Severity and timing of effects depends on the concentration, duration of exposure, and penetrability of the exposed tissue; pain may be delayed. 3. The fluoride ion may cause decalcification and corro-sion of bone beneath the area of dermal burn. Bone destruction is extremely painful. · Inhalation causes severe throat irritation, cough, dyspnoea, cyanosis, lung injury and noncardiogenic pulmonary oedema. · Ingestion is associated with severe, burning pain followed by retching and vomiting. There is often haemorrhagic gastritis and frank haematemesis. · Systemic fluoride toxicity from ingestion or dermal or injection exposure to hydrofluoric acid may result in severe hypocalcaemia, hypomagnesaemia, hyperkalaemia, meta-bolic acidosis, and cardiac arrhythmias (QTc prolongation, torsade de pointes, and ventricular arrhythmias including bigeminy, ventricular tachycardia, refractory ventricular fibrillation, and cardiac arrest). Cardiac toxicity generally manifests within six hours of an exposure. 1. Patients with a history of significant exposure or with signif-icant symptomatology should be admitted to an intensive care unit and observed with continuous ECG monitoring for a minimum of 24 to 48 hours. 2. Obtain at least hourly serum electrolytes including serial total or ionised calcium, magnesium, and potassium levels. Total calcium may not reflect true hypocalcaemia, but usually has a more rapid turnaround. Therapy should be directed toward signs and symptoms of toxicity. Serum fluoride level may be used to confirm hydrofluoric acid exposure. 3. Obtain serial ECGs looking for signs of hypocalcaemia (prolonged QTc interval) and hyperkalaemia (peaked T waves). Institute continuous cardiac monitoring. –– Wash burnt areas copiously with water, preferably under a shower or tap for at least 15 to 30 minutes. –– If hydrofluoric acid has been ingested, attempt immediate administration of a fluoride binding substance. Options include milk (one-half to one glassful), chewable calcium carbonate tablets, or milk of magnesia. Avoid large amounts of liquid, since this may induce vomiting. –– Stomach wash is risky and best avoided. But it may be done if spontaneous vomiting has not occurred, and the time between ingestion and treatment is less than 90 minutes. Addition of 10% calcium gluconate to the lavage fluid may provide some free calcium to bind the fluoride. –– Inhalation injury is treated by removing the victim from the scene into fresh air, followed by decontami-nation of the clothes and skin. The patient should be subsequently observed for signs of laryngeal oedema, pneumonitis, and pulmonary oedema. –– Ocular exposure should be treated with copious irrigation of the eye for at least 30 minutes. Local ophthalmic anaesthetic drops may be instilled to obtain patient compliance for the prolonged irriga-tion. The pH of the eye fluid should be periodically checked with litmus paper, and irrigation is continued until it is normal. Subsequently, an ophthalmic consul-tation is mandatory. –– For exposure to weak solutions of hydrofluoric acid (less than 20%), local application of 2.5% calcium gluconate gel is the treatment of choice. Since this gel is not available in India, it has to be prepared by the physician by mixing 3.5 grams of calcium gluconate powder with 150 ml of a water soluble lubricant such as K-Y jelly, which will result in a 2.5% gel. Repeated applications may be necessary. –– After applying the gel, an occlusive barrier can be used (e.g. vinyl gloves or plastic wrap). –– For skin lesions resulting from exposure to concen-trate hydrofluoric acid, local infiltration (injection) of 10% calcium gluconate is necessary (0.5 ml/cm2 of skin, with a 30 gauge needle). –– Do not inject calcium chloride into the tissues locally, since it is itself a corrosive and can accen-tuate tissue damage. Similarly, local infiltration of magnesium sulfate or calcium gluconate are also not recommended today by several clinicians, though there are a few who still advocate their use. If it is decided to be done, a 10% solution should be injected with a 30 gauge needle in amounts no greater than 0.5 ml/cm2 into and around the affected area. -- Estimate the serum calcium, magnesium, and phosphorus levels, as well as the prothrombin time (PT), and partial thromboplastin time (PTT). -- The appropriate artery is cannulated with a 20 gauge, 4 French or 5 French arterial catheter. If fingers are involved, the brachial artery is cannulated; if the foot is involved, the femoral artery is cannulated. -- It is imperative to admit the patient to the ICU for arterial pressure wave monitoring. -- An intra-arterial infusion of 10 ml of 10% calcium chloride diluted with 40 ml of normal saline is given over 4 hours. -- The arterial wave form is checked hourly and the arterial line is flushed with heparinised saline. -- After infusion of the calcium chloride solution, flush out the tubing with 10 ml of normal saline over a 15 minute period. -- Catheter clotting can be prevented by adding 500 units of heparin to the infusion mixture. In case such clots do occur, they can be lysed with 5000 units of urokinase. -- At the end of 4 hours, the affected extremity is checked for residual pain and tenderness. If this persists, repeat the infusion. -- Estimate serum calcium, magnesium, phos-phorus, PT, PTT, 1 hour after completion of the infusion. If the magnesium level has fallen by 0.3 mg% (or falls below 1.7 mg%), an IV infu-sion of magnesium sulfate is begun using 1.015 mEq/hr to 4.06 mEq/hr. -- The process of 4 hours of infusion followed by 4 hours of rest is repeated until there is no residual tenderness to gentle pressure. –– Regional intravenous perfusion of 5 ml of 10% calcium gluconate in 20 ml of normal saline is reported to give immediate relief of pain in a burnt extremity. –– Ingestion of hydrofluoric acid resulting in hypocal-caemia or hypomagnesaemia may require multiple IV doses of calcium gluconate and magnesium sulfate (together with repeated cardioversion for ventricular fibrillation) until normal blood calcium and magnesium levels are achieved. –– Patients should be monitored for laboratory and/or ECG evidence of hyperkalaemia after ingestion of hydrofluoric acid. Fluoride-induced hyperkalaemia, once developed, may be irreversible. Therapeutic intervention to prevent development of elevated serum potassium is essential. Quinidine has been shown to be effective in preventing the K+ efflux from cells and preventing cardiotoxicity. Intravenous calcium has no effect on circulating potassium levels, but it antagonises cardiac toxicity in patients demonstrating cardiac signs and/or symptoms of hyperkalaemia. Administer intravenous sodium bicarbonate to shift potassium intracellularly. Evaluate for and treat hypocal-caemia, hypomagnesaemia and hyperkalaemia. Because amiodarone has potassium channel blocking effects, it may be the preferred antiarrhythmic in the setting of hydrofluoric acid poisoning. Systemic acidosis should be corrected with appropriate IV doses of sodium bicarbonate.Hypotension should be managed with volume expansion and vasopressors. Essentially the same as for sulfuric or hydrochloric acid. There is evidence of more severe tissue destruction. Most cases are due to accidental exposure at the work place.